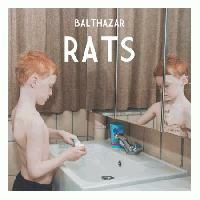 Balthazar's applauded debut showcased a remarkable freshness of subterranean quality. Smooth, catchy and lyrical altogether, Applause endured several dangerous listens: those of the lazy Sunday evenings, the tired ones after work-time or the ones during the late reading hours. In each case it survived oblivion through an idiosyncratic mixture of agitating and almost danceable music formula. Rats finds the Belgian group in a less quirky and more languorous disposition. It's not that the hopping and catchy basslines have been completely wiped out, neither that the seductive, passionate strummings are totally absent. But the carefree, bouyant attitude of Applause has given way to a more bohemian understanding of pop-rock songwriting. Unburdened and foundered under a dramatic persona of luck-stricken troubadours, Balthazar seem to have chosen a style of blithe and poignant storytelling for their second album. "Joker's Son" is a perfect example of their new approach, with its lazy horns and its earnest statements : "A joker's son/ my coat's somewhere around town/ I never won but I rest assure that I can endure/ The spinning". Slow paced and relaxed, Rats delivers a feeling of whimsical obtrusiveness. The consoling melodies of "Lion's Mouth", the almost haunting in their simplicity woodwind synths in "Do Not Claim Them Anymore" and the slow climax of "Any Suggestion" are among others, moments of excellence, inside a lush symphony of whistling tunes and romantic tales. It's a sheer effortlessness that's probably the most stunning thing about Rats, a quality of being inconspicuously pleasant that undermines any technical proficiency or innovation which tries to evaluate the album. Along with some restlessness, Balthazar may have sacrificed any surprises, shivers and thrills that a contingent development of Applause's sound could hold. But maybe that's for the better, as Rats already seems to has found some joy in small things, rather than striving for the excellence in the big ones. And it goes without saying that the Sunday evenings and the late reading hours have been painted anew. c'mon sputnik listen to this band! Not really my thing, but the review does make a persuasive argument. Good stuff, man, have a pos. Awesome follow-up. Their style remains totally unique, but this album is a bit more loose than its predecessor. thanks for the feedback clercqie and Paper! I'll be checking this out, didn't really pay attention to the band but I guess it's worth a spin. Yes, it's pretty enjoyable indeed. Your reviews get better and better, Scissor. Keep up the hard work! Do you like the band Spoon, Omaha? I don't recall hearing anything from them I've particularly cared for, but I may be thinking of an entirely different group. Either way, I haven't heard them much at all. Are they of similar style to this group? Congrats on the feature scissor dude.